Members of the Pediatric Oncology team at Penn State Children’s Hospital participate in National Wear Red Day. The Penn State Hershey Commission for Women led a “Heart Health Jeopardy” game for employees, faculty and students on the Hershey campus Friday. The game featured questions on the signs and symptoms of a heart attack, nutrition and devices used in heart care. Penn State Heart and Vascular Institute provided prizes for the winning team. 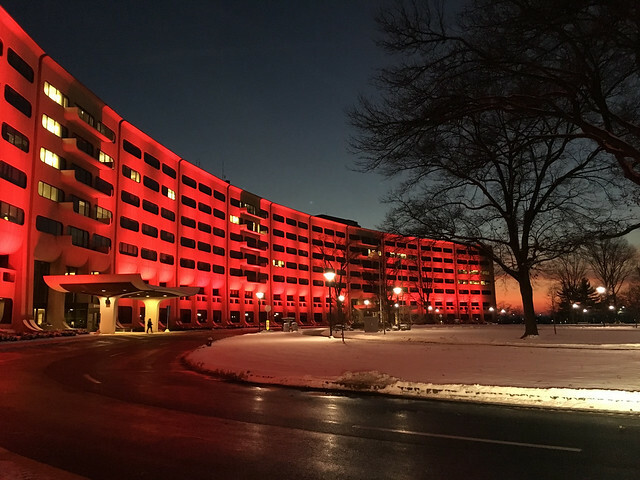 The Heart and Vascular Institute has sponsored the Go Red for Women campaign in the Capital Region for the past seven years. The American Heart Association’s annual National Wear Red Day helps raise awareness of cardiovascular disease and stroke. Heart disease is the number one cause of death in women, according to the U.S. Food and Drug Administration, and one in four deaths nationally are caused by heart disease, according to the Office of Disease Prevention and Health Promotion. Learn about some simple lifestyle changes that can reduce the risk of heart disease and stroke on the American Heart Association website.